TECHNOLOGIES CO., LTD. Copyright © 2012 TP-LINK TECHNOLOGIES CO., LTD.
conjunction with any other antenna or transmitter.? prohibited for use with this device. The required antenna impedance is 50 ohms. fonctionnement non souhait? de l?appareil. Cet appareil num?rique de la classe B est conforme ? la norme NMB-003 du Canada. 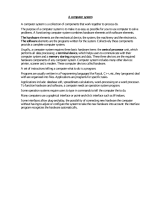 requirements of the Canadian interference-causing equipment regulations. product or the power adapter from the power source. and voiding the limited warranty. If you need service, please contact us. Avoid water and wet locations. missing, please contact your distributor. 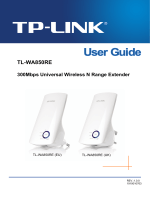 TL-WA850RE 300Mbps Universal Wireless N Range Extender without any explanations. from the actual situation. You can set the parameters according to your demand. specifications. As follows we just take that of EU version for example. 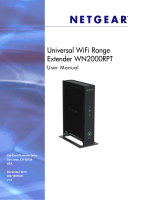 Universal Wireless N Range Extender delivers complete data privacy. The Range Extender is connected the router successfully. The Range Extender is connecting the router. The Range Extender is not connected any router yet. The Wireless function is disabled. The Wireless function is enabled. There is no device linked to the corresponding port. There is a device linked to the corresponding port but no activity. There is an active device linked to the corresponding port. RESET: This button is used to restore the Range Extender?s factory default settings. then release the button and wait the Range Extender to reboot to its factory default settings. Range Extender's Web-based management page. that this port is not allowed to be connected with router or AP. on the types of materials and background RF (radio frequency) noise in your home or office. TL-WA850RE somewhat nearer to the Wireless router. Wireless router. It?s better to locate it in a spacious place, such as near the corridors. Blue tooth devices, cordless phones, microwave ovens, etc. blue, in order to guarantee a good performance. clients; so the transmission time will be double-increased, while the speed will be decreased. Leave at least 2 inches (5cm) space around the device for heat dissipation. Operating temperature of the Range Extender should be 0?~40? (32?~104?). Operating humidity of the Range Extender should be 10%~90%RH (Non-condensing). 1. Connect the Cable/DSL modem to a Wireless router with an Ethernet cable. 4. Log in the web-based management page of TL-WA850RE and complete the configurations. connect TL-WA850RE to the wireless router. UNIX OS with a Web browser, such as Microsoft Internet Explorer, Mozilla Firefox or Apple Safari. http://tplinkextender.net in the address field of the browser. Name and Password (both in lower case letters). Then click OK or press Enter. cancel the Using Proxy checkbox, and click OK to finish it. Figure 3-4 will appear for you to choose the region. Then click Next to continue. The device will detect the existing network. Please wait for a while. network, and then click Next. Password of your selected target network and then click Next to continue. previous pages and reconfigure it. and instructions for the corresponding page. Firmware Version - This field displays the current firmware version of the Range Extender. Hardware Version - This field displays the current hardware version of the Range Extender. root wireless network which the device is connecting to. your device is connecting to. Signal - It shows the root wireless network's signal strength that the device has received. network, while if it shows "disconnected", you can click "connect" to connect. Wired - This field displays the current settings or information for the Network. IP Address - The IP address of the wired LAN. Subnet Mask - The subnet mask associated with IP address. Wireless - This field displays basic information or status for wireless function. called SSID) which your PC or other device can be connected to. Channel - The current wireless channel in use. Mode - The current wireless mode which the Range Extender works on. Channel Width - The bandwidth of the wireless channel. PC or other devices which are connected to the it. Traffic Statistics - This field displays the Range Extender's traffic statistics. Sent (Bytes) - Traffic that counted in bytes has been sent out from wireless. Sent (Packets) - Traffic that counted in packets has been sent out from wireless. Received (Bytes) - Traffic that counted in bytes has been received from wireless. Received (Packets) - Traffic that counted in packets has been received from wireless. Click the Refresh button to get the latest status and settings of the device. Please refer to Chapter 3 Quick Installation Guide. section will guide you to add a new wireless device to an existing network quickly by WPS function. The WPS function can be configured on the page as shown in Figure 4-2. Operation Mode - Displays the current operation mode of the device. WPS Status - To enable or disable the WPS function here. device can be found in the label or User Guide. Restore PIN - Restore the PIN of the device to its default. PIN. You can ensure the network security by generating a new PIN. an external Registrar, this function will be disabled automatically. adapter and device using either PBC (Push Button Configuration) method or PIN method. adapter, here takes the Wireless Adapter of our company for example. Choose ?Press the button of the new device in two minutes? and click Connect. Wait until the next screen appears. Click OK to complete the WPS configuration. In this example, the default PIN code of this adapter is 19342306 as the above figure shows. button in Figure 4-2, then the following screen will appear. the field behind PIN in the previous figure. Then click Connect. and enter the PIN code of the Range Extender into the PIN field. Then click Connect. You will see the following screen when the new device has successfully connected to the network. disabled. Please make sure the Wireless function is enabled before configuring the WPS. Profile function can help you remember previously connected wireless networks. Choose - You can choose any one wireless network you want to connect to. Root SSID - the SSID (wireless network name) of your root device, a wireless router or AP. MAC - The physical address of your root AP, also called BSSID. Security Type - the security type of your root device. Modify - You can Edit or Delete the profiles. 1. Click Add in the Profile list page as shown in Figure 4-11.
type of your root device and also enter the wireless password. Then click to Save your profile.
? Root SSID - The wireless network name of your root AP this profile will connect to.
? MAC of Root Device - The MAC of your root device this profile will connect to. to. Please make sure it's the same as the root AP's. same as your root AP. Click Save to save this profile in the profile list and go back to the Profile List page. Click Back to go back to the Profile List page, without saving any configuration on this page. Click Edit to further edit the profile(s), or Delete to delete the profile(s). Click Add to add a new profile to the list. Click Delete All to delete all the information in the profile list. settings of the Range Extender. Selecting Network > LAN will enable you to configure the IP parameters of Network on this page. Static IP - In this type, you can configure IP Address/Gateway manually. 255.255.255.0 as the subnet mask. Gateway - The gateway should be in the same subnet as your IP address. IP you set to log in the Range Extender's web based utility. network. MAC filtering allows you to control the access of wireless stations to the Range Extender. Wireless Advanced allows you to configure some advanced parameters for the Range Extender. to get detailed information about the current connected wireless stations. function. The detailed explanations for each submenu are provided below. operation mode, here we just take that in Range Extender mode 1 for example. and Range Extender mode 2. Survey - Click this button, you can search the AP which runs in the current channel. client. You can also use the search function to select the SSID to join. client. You can also use the search function to select the BSSID to join. or region is not listed, please contact your local government agency for assistance. list, the dialog shown in Figure appears below. Click OK.
some devices that use a different transmission mode, choose the appropriate "Mixed" mode. Max Wireless Rate - You can limit the maximum wireless rate of the device through this field. will be reminded to reboot the device. types: WEP and WPA/WPA2-Personal. Wireless security can be set on the following screens. Range Extender mode 1 for example. Operation Mode - Shows the current operation mode. recommended that you choose one of the security types to enable security. WPA/ WPA2-Personal - Select WPA based on pre-shared key. Version - You can select one of following versions. WPA-PSK - Pre-shared key of WPA. WPA2-PSK - Pre-shared key of WPA2. can select Automatic, TKIP or AES as Encryption. Wireless Password - Enter a passphrase here. can be either 0 or at least 30. Enter 0 to disable the update. WEP - Select 802.11 WEP security. Type - You can select one of following types. based on the wireless station's capability and request. Shared Key - Select 802.11 Shared Key authentication type. Open System - Select 802.11 Open System authentication type. stands for any combination of hexadecimal digits (0-9, a-f, A-F) in the specified length. identical on all wireless stations in your network. encryption. "Disabled" means this WEP key entry is invalid. a-f, A-F, zero key is not permitted) or 5 ASCII characters. 0-9, a-f, A-F, zero key is not permitted) or 13 ASCII characters. 0-9, a-f, A-F, zero key is not permitted) or 16 ASCII characters. selected Shared Key as Authentication Type. Be sure to click the Save button to save your settings on this page. device, which depend on the station's MAC addresses. Filtering function. The default setting is disabled. Wireless MAC Address Filtering entry" page will appear, shown in Figure 4-20. MAC Address - Enter the wireless station's MAC address that you want to control. Description - Give a simple description of the wireless station. Status - Select a status for this entry, either Enabled or Disabled. Select Enabled or Disabled for this entry on the Status pull-down list. Click the Save button to save this entry. To add additional entries, repeat steps 1-4. Click the Disable All button to make all entries disabled. 1. Click the Enable button to enable this function. to access for Filtering Rules. 3. Delete all or disable all entries if there are any entries already. Status pull-down list. Click the Save button. thus, no wireless stations can access the device. in either operation mode, here we just take that in Range Extender mode 1 for example. or Low which you would like. High is the default setting and is recommended. determines the time interval of the beacons. The default value is 100.
receiving station and negotiate the sending of a data frame. The default value is 2346.
performance since excessive packets. 2346 is the default setting and is recommended. DTIM Interval - Determines the interval of the Delivery Traffic Indication Message (DTIM). indicates the DTIM Interval is the same as Beacon Interval. transmitted preferentially. It is strongly recommended enabled. reducing the guard interval time. cannot access each other through WLAN. information in the following screen shown in Figure 4-22.
connected wireless stations, click the Refresh button. the next page and click the Previous button to return the previous page. This page will be refreshed automatically every 5 seconds. the following screen shown in Figure 4-23. Rate - The Throughput unit. Run Time - How long this function is running. Transmit - Wireless transmit rate information. 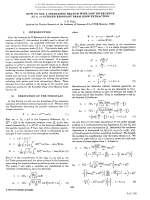 Receive - Wireless receive rate information. Click the Start button to start wireless throughput monitor. Click the Stop button to stop wireless throughput monitor. need to manually assign new IP addresses. DHCP Client List. Clicking either of them will enable you to configure the corresponding function. The detailed explanations for each submenu are provided below. (shown as Figure 4-26), only when you?ve set the Network LAN type as Static IP in Figure 4-15.
you need. The DHCP Settings page will appear as Figure 4-25.
is the default start IP address. is the default end IP address. is 1 ~ 2880 minutes. The default value is 120 minutes. if you don?t know the DNS value. The factory default setting is 0.0.0.0.
two DNS servers. The factory default setting is 0.0.0.0. Assigned IP and Lease Time for each DHCP Client attached to the device (Figure 4-27). ID - Here displays the index of the DHCP client. Client Name - Here displays the name of the DHCP client. MAC Address - Here displays the MAC address of the DHCP client. client will request to renew the lease automatically. attached devices, click on the Refresh button. you can find out what happened to the system in System Log. each submenu are provided below. firmware for the device on the screen shown in Figure 4-29. New firmware versions are posted at http://www.tp-link.com and can be downloaded for free. Firmware Version - Here displays the current firmware version. upgrade file must accord with the current hardware version. settings to avoid losing important configuration settings of device. device will reboot after the Upgrading has been finished. the device on the screen shown in Figure 4-30. Click Restore to reset all configuration settings to their default values. Any settings you have saved will be lost when the default settings are restored. local computer as a file or restore the device's configuration on the screen shown in Figure 4-31. Click Backup to save all configuration settings to your local computer as a file. Click Browse? to find the configuration file which you want to restore. input or selected in the blank. automatically then. Keep the power of this device on during the process, in case of any damage. Selecting System Tools > Reboot allows you to reboot the device on the screen shown in Figure 4-32. Click the Reboot button to reboot the device. Change LAN IP Address (System will reboot automatically). Change the Web Management Port. Upgrade the firmware of the device (system will reboot automatically). Restore the device's settings to factory defaults (system will reboot automatically). Update the configuration with a file (system will reboot automatically). password of the device on the screen shown in Figure 4-33.
be prompted for the device's user name and password. any spaces. Enter the new Password twice to confirm it. Click Clear All to clear all. The device can keep logs of all traffic. You can query the logs to find what happened to the device. Log Type - By selecting the log type, only logs of this type will be shown. Log Level - By selecting the log level, only logs of this level will be shown. Click the Refresh button to show the latest log list. Click the Save Log button to save all the logs in a txt file. characters of each device?s MAC address). This value is case-sensitive. T1. How do I restore my Range Extender?s configuration to its factory default settings? There are TWO methods available to restore the factory defaults. button on the rear panel for more than 8 seconds before releasing it. Tools -> Factory Defaults? and click ?Restore?. T2. What can I do if I forget my password? Try to reconfigure your Range Extender by following the instructions of this UG. T3. What can I do if I cannot access the web-based configuration page? please proceed to the next step; otherwise, check the connections again. default domain http://tplinkextender.net in the address field and get logged in. to get into the web-based configuration page, reconfigure the device. Feel free to contact our technical support, if the problem still persists. and thus access the Internet, either via TL-WA850RE or without. console, DVR and so on. stronger after repeated by TL-WA850RE? connection is poor, or when you want a larger wireless coverage to eliminate ?dead zones?. Domain Name - A descriptive name for an address or group of addresses on the Internet. the wireless Access Point and to the wireless network name. 152-bit shared key algorithm, as described in the IEEE 802.11 standard. fact, WPA was developed by the networking industry in response to the shortcomings of WEP.